At Contour Dermatology we pride ourselves in using the most efficient state of the art technology to treat specific patient concerns. Laser hair removal is a popular non-invasive treatment that has been proven to adequately remove hair from any unwanted area. 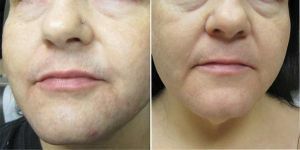 We have provided laser hair removal to our patients for over 15 years. Laser hair removal uses a low-energy laser to gently remove unwanted hair. 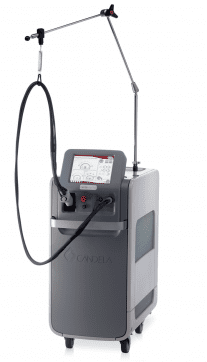 The laser energy passes through the skin and is absorbed by the pigment in the hair follicle. In a fraction of a second, all of the treated hair follicles are disabled. Patients should avoid tweezing, plucking or waxing 4-6 weeks prior to appointment. It is advised to shave hairier areas 1 day prior and/or use depilatories 3-5 days prior to treatment. Although laser hair removal results will vary from patient to patient depending on skin and hair color; most patients experience an 80-90% reduction in the amount of hair in a given area, but should not expect to be hair free. Yes, with the exception of eyelashes, due to the proximity of the eye and the danger of eye injury with a laser. The number of sessions you need is dependent on a few factors. Some of these factors are hair color, skin pigmentation, hair density and your hormonal status. Typically patients can expect to need 5-6 sessions, with the possibility of needing more, especially for darker skin types. There is a stinging sensation felt during treatment, however most patients who have waxed report that it feels less painful than waxing. We do recommend and offer topical numbing to help ease the feeling, as well as a cooling device. What are possible side effects of Laser Hair Removal? Side effects can include blistering, hyperpigmentation (darkening of an area of skin caused by increased melanin), hypopigmentation (loss of skin color) or scarring.